For the 1920s airliner of the same name, see Armstrong Whitworth Argosy. The Armstrong Whitworth Argosy was a British post-war military transport/cargo aircraft and was the last aircraft produced by Armstrong Whitworth Aircraft. Although given different type numbers, the AW.650 civil and AW.660 military models were both called "Argosy" and for practical purposes are basically the same design. 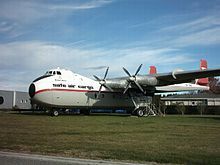 The Argosy came from the Air Ministry "Operational Requirement 323" (OR323) which resulted in a specification issued in 1955 for a medium-range freight aircraft capable of lifting 25,000 lb (11,340 kg) and that had a range of 2,000 mi (3,200 km) with 10,000 lb (4,500 kg). This led AW to develop a twin-engine design for the military, the AW.66. The potential for civil sales led to a civil design AW.65, which differed by having full section doors at each end of the fuselage to allow quick loading and unloading. A lack of funds led to abandonment of the military requirement, but Armstrong Whitworth had already decided to go ahead with the civil variant as a private venture, it being redesigned with four Rolls-Royce Darts as the AW.650. The AW.650 was a high-wing four-engined general-purpose transport aircraft, powered by four Rolls-Royce Dart turboprop engines driving Rotol four-blade propellers. The tailplane was on twin booms from the inner engine nacelles, leaving the cargo doors at the rear of the fuselage clear for straight-in loading, while sideways-opening doors were fitted at both ends of the fuselage, with the flight deck high up in the nose. This gave an unobstructed cargo space measuring 10 by 47 feet (3.0 m × 14.3 m) with a sill height corresponding to that of a normal flatbed truck. This unusual "pod and boom" structure, similar to the earlier C-82 Packet and C-119 Flying Boxcar transports, would earn it the nickname "The Whistling Wheelbarrow". It had a maximum weight of 88,000 lb (39,915 kg) and a payload of 28,000 lb (12,700 kg). Cruising at 276 mph (444 km/h), it had a range of 1,780 mi (2,865 km) and could seat 89 passengers. The first Argosy made its maiden flight on 8 January 1959, receiving Federal Aviation Administration type certification on 2 December 1960. 10 of the initial civil version, the Series 100, were built. While the RAF had lost interest in the original AW.66, it still needed to replace its obsolete piston engined Vickers Valettas and Handley Page Hastings, and in 1959 the British Air Ministry drew up a specification for a military derivative of the AW.650 to serve as a medium-range transport, paratroop and supply aircraft. The resultant design, the AW.660, was significantly different from the AW.650. It had the nose door sealed to take a weather radar radome, the rear doors were changed to 'clam shell' style with an integral loading ramp, a stronger cargo floor was fitted. Two doors were fitted, one each on the starboard and port sides, to enable paratroopers to exit. The military Argosy had four Rolls-Royce Dart 101 turboprops and had twice the range of the civil Series 100. The new clamshell doors were tested on the second Argosy Series 100 from July 1960, while the first of the RAFs 56 Argosies flew on 4 March 1961. British European Airways was interested in the Argosy as a replacement for its piston engined freighters, but the payload capacity of the Series 100 meant that it would not be profitable. In order to save money, the wing had been based on that of the Avro Shackleton, built by another part of the Hawker Siddeley Group, but to meet BEAs requirements, a new wing was designed, of the same aerodynamic design, but with a more modern "Fail safe" structure rather than the Safe-life design of the earlier wing. This produced a wing that was both stronger and lighter, while the new wing did not have a limited fatigue life. The revised version, the Series 200, also had larger cargo doors, integral wing fuel tanks and a modified landing gear. The first Series 200 flew on 11 March 1964, being followed by six more Series 220s, with more powerful engines. A final Series 220 was not completed and was scrapped. The Argosy Series 100 entered service with the American cargo airline Riddle Airlines, which planned to use them to meet contracts to provide logistics support to the United States Air Force within the United States, at the end of 1960, Riddle purchasing seven Argosies. When Riddle lost the logistics contract in 1962, its Argosies were repossessed by Armstrong Whitworth and sold on to other airlines which had taken over the contracts from Riddle. BEA ordered Armstrong Whitworth's three remaining Series 100s as a stopgap until it could receive its definitive Series 220s, for which it placed an order for five in 1964. It lost two Series 220s in crashes and purchased another to replace the lost aircraft. The small fleet of Argosies remained unprofitable, even when BEA received the more capable series 220s, and BEA withdrew its Argosy fleet in April 1970, replacing them with a freighter conversion of its Vickers Vanguards. Two aircraft operated later by SAFE Air in New Zealand as the main link between the Chatham Islands and the mainland, were fitted with a pressurised "passenger capsule". One of these aircraft was damaged beyond repair in a landing accident in April 1990, and a third Argosy was leased by SAFE Air from Mayne Nickless of Australia for five months during 1990 as a replacement. The last flight by a New Zealand Argosy was made by operator SAFE Air in September 1990, that aircraft now being preserved by volunteer owners near Woodbourne Airport, Blenheim, New Zealand. The last Argosies, operated by American cargo airline Duncan Aviation, were withdrawn in 1991. The Argosy was used by the Royal Air Force for its capability to accommodate 69 troops, 48 stretcher cases or 29,000 lb (13,000 kg) of freight. This meant it could carry military equipment such as the Saracen or Ferret armoured cars, or artillery such as the 105 mm (4.13 in) howitzer or Wombat. Design changes to the Saracen and the mainspar running through the top of the freight bay subsequently precluded the use of the Argosy as a Saracen transport. The earliest deployments were in 1962 to 105 Squadron in the Middle East and 114 and 267 Squadrons at RAF Benson. The following year, 215 Squadron received its Argosies when based at RAF Changi, Singapore. The squadron was disbanded on New Year's Eve 1967, and the aircraft went to 70 Squadron at RAF Akrotiri, Cyprus. This was the last squadron to operate the aircraft in the transport role when it retired the last aircraft in February 1975; replacement by the Lockheed Hercules in RAF service had begun from December 1970. The E.1 version of the Argosy was with 115 Squadron from 1968 to 1978, most of the time based at RAF Cottesmore, and was used in the calibration role. Operational Argosy E.1 of No. 115 Squadron RAF in 1977. A total of 17 were built for civil operators Riddle Airlines (Series 101) and British European Airways (series 102 and 222). 10 Series 101 and 102 aircraft were built. Seven Series 200 aircraft were built (the eighth was not completed); the series 200 had a larger freight hold and enlarged front and rear doors to enable it to carry standard size cargo pallets. The series 200 also had a lighter redesigned wing increasing the maximum range and Rolls-Royce Dart 532/1 turboprops. 56 aircraft were produced for the RAF with the designation Argosy C Mk 1 (C.1) and served in six squadrons; three in the UK and one each in Aden, Cyprus, and the Far East. The Argosy was withdrawn from service in 1975 as an economic measure. Those aircraft not scrapped or retained were sold to commercial operators. In 1963, Hawker Siddeley Group dropped the names of its component companies, rebranding its products under the Hawker Siddeley banner. To meet a requirement for a RAF flight inspection aircraft, nine Argosy C.1s were modified in 1971 as the Argosy E.1. These were a regular sight at British military airfields, being operated by 115 Squadron until they were replaced by the Hawker Siddeley Andover in 1978. After the removal of the Argosy C.1 from the cargo/transport role, it was decided to modify 14 aircraft as Navigation Trainers for RAF Training Command, to replace the Vickers Varsity. One aircraft XP411 was re-designated as the Argosy T Mk 1 in advance of delivery of the T Mk 2 fleet. Only two aircraft (XP447 and XR136) were modified as the Argosy T.2, but they were not successful and the programme was abandoned due to defence cuts. XP447 at Fox Field, Lancaster, California, USA. ZK-SAE Merchant Enterprise – 222 on static display near Woodbourne Airport in Blenheim, Marlborough. G-APRL – 101 on static display at the Midland Air Museum in Baginton, Warwickshire. G-BEOZ – 101 on static display at the Aeropark in Castle Donington, Leicestershire. XN819 – C.1 cockpit on static display at the Newark Air Museum in Newark, Nottinghamshire. XP411 – C.1 on static display at the Royal Air Force Museum Cosford in Cosford, Shropshire. XP447 – T.2 in storage at General William J. Fox Airfield in Lancaster, California. XR143 – E.1 in storage at the Mid America Museum of Aviation & Transportation in Sioux City, Iowa. It is being refurbished to RAF appearance. ^ a b Tapper 1988, p.310. ^ a b Taylor 1965, p.151. ^ Willing Air Enthusiast July/August 2003, p.57. ^ Gunston Flight 10 February 1961, p.181. ^ a b Willing Air Enthusiast May June 2003, pp. 42–43. ^ Tapper 1988, pp. 322–323. ^ Willing Air Enthusiast May June 2003, p. 42. ^ Willing Air Enthusiast May/June 2003, pp. 40–41. ^ Tapper 1988, pp. 324–325. ^ Willing Air Enthusiast July/August 2003, p.61. ^ Jefford 2001, p. 49. ^ Jefford 2001, p. 60. ^ Air-Britain Aeromilitaria, December 2016, p. 187–188. ^ a b c Simpson 2014. ^ a b c Hunnisett, Phil. "RAF Aircraft - 2nd 20". AWA ARGOSY. ^ a b Hunnisett, Phil. "RAF Aircraft - Last 16". Argosy Air. Retrieved 8 August 2018. ^ "The Chatham Island Story". The Argosy Marlborough. The Argosy Trust. Retrieved 29 July 2018. ^ a b c Hunnisett, Phil. "Civil Aircraft". Argosy Air. Retrieved 30 July 2018. ^ "Our Aircraft - Full Listing". Midland Air Museum. Archived from the original on 18 June 2007. Retrieved 29 July 2018. ^ "Aeropark Exhibits". East Midlands Aeropark. Aeropark Heritage Aircraft Collection. Retrieved 29 July 2018. ^ "Aircraft List". Newark Air Museum. Retrieved 29 July 2018. ^ "Armstrong Whitworth Argosy C1". Royal Air Force Museum. Trustees of the Royal Air Force Museum. Retrieved 29 July 2018. ^ Taylor 1965, p.152. "The civilian Argosy could be operated by two pilots"
^ Tapper 1988, pp. 329–330. Gunston, W. T. "A.W.660: A Multi-mission Military Transport". Flight, 10 February 1961, Volume 79, No. 2709. pp. 181–185. Jefford, Wing Commander C.G., MBE, BA, RAF(Retd.). RAF Squadrons, a Comprehensive record of the Movement and Equipment of all RAF Squadrons and their Antecedents since 1912. Shrewsbury, Shropshire, UK: Airlife Publishing, 1988 (second edition 2001). ISBN 1-85310-053-6. Tapper, Oliver. Armstrong Whitworth Aircraft since 1913. London:Putnam, 1988. ISBN 0-85177-826-7. Taylor, John W. R. Jane's All The World's Aircraft 1965-66. London:Sampson Low, Marston & Company, 1965. Willing, Martin. "Hawker Siddeley's Crisp Carrier: Homage to the AW Argosy:Part One". Air Enthusiast, No. 105, May June 2003. Stamford, UK:Key Publishing. pp. 40–43. ISSN 0143-5450. Willing, Martin. "Hawker Siddeley's Crisp Carrier: Homage to the AW Argosy:Part Two". Air Enthusiast, No. 106, July/August 2003. Stamford, UK:Key Publishing. pp. 57–62. ISSN 0143-5450. "BEA's new Argosy". Flight International, 28 January 1965, Volume 87, Issue 2916. pp. 141–145. Wikimedia Commons has media related to Armstrong Whitworth Argosy (A.W.650 & A.W.660). This page was last edited on 31 March 2019, at 20:37 (UTC).